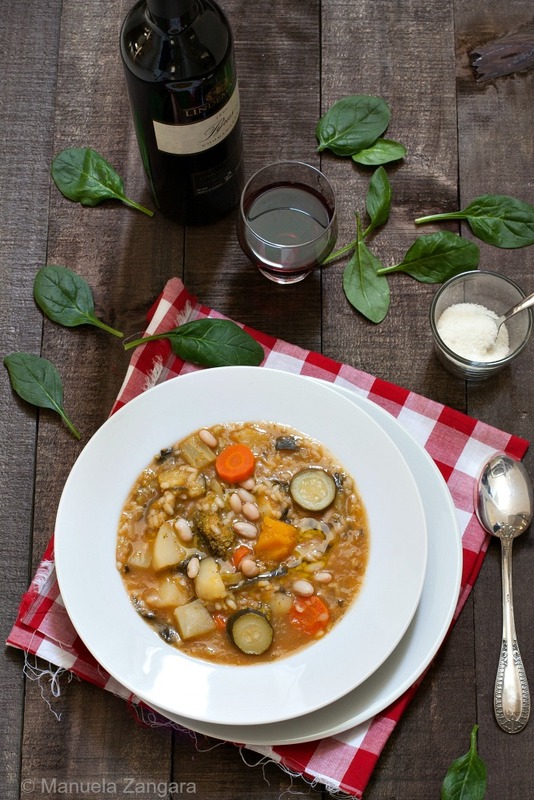 Having grown up in Milan, where winters are quite cold, I have had my fair share of soups. In fact, my mum would often make soup for dinner. 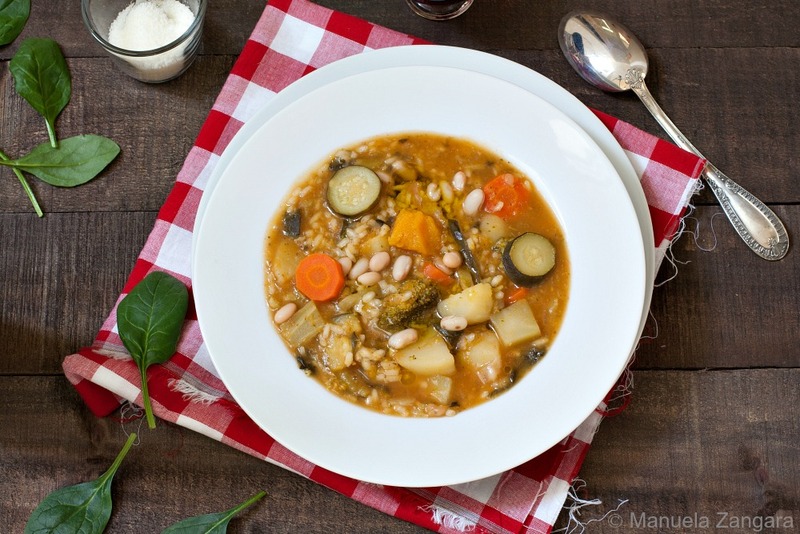 My favourite has always been Pasta e Fagioli, but she has always made a fantastic Minestrone. Contrary to what it may seem, Minestrone is actually a pretty easy soup to make and it does not take much time at all! I have been asked a few times by my readers to publish the recipe for Minestrone and I am happy to oblige! 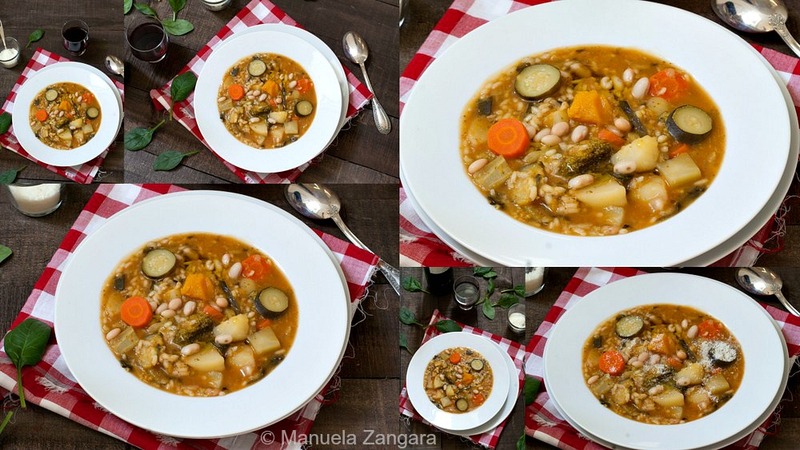 The truth is, there is no real recipe for Minestrone (which, in case you did not know, means “big soup” in Italian), as its ingredients can vary from house to house… and from one week to the other. We usually make do with what we have in the fridge and play around with seasonal vegetables to come up with all sorts of delicious combinations. Anyhow, the recipe below is a good representation of authentic Italian Minestrone… feel free to use it as is, or add a few of your favourite vegetables. I don’t use stock to make my Minestrone. I try to keep it as healthy as possible, so I use water to help the flavour of the vegetables shine and I do not fry off the vegetables at the beginning of the preparation. I don’t think it adds anything in terms of taste and when I eat Minestrone, I know it is totally good for me and it tastes delicious. Also, make sure to add a drizzle of good quality extra virgin olive oil at the end, as that is what makes this soup taste super delicious. If you want, you can also top it with a sprinkle of cheese. I like mine with Pecorino Romano, but many Italians prefer Parmigiano Reggiano in their Minestrone. Also, I add rice to it as I do not like pasta with Minestrone and, even though you can make it with pasta too, I suggest you try it with rice: it is really good. This is my nonno’s favourite dish… so I dedicate it to him. Love you nonno! Buon appetito! 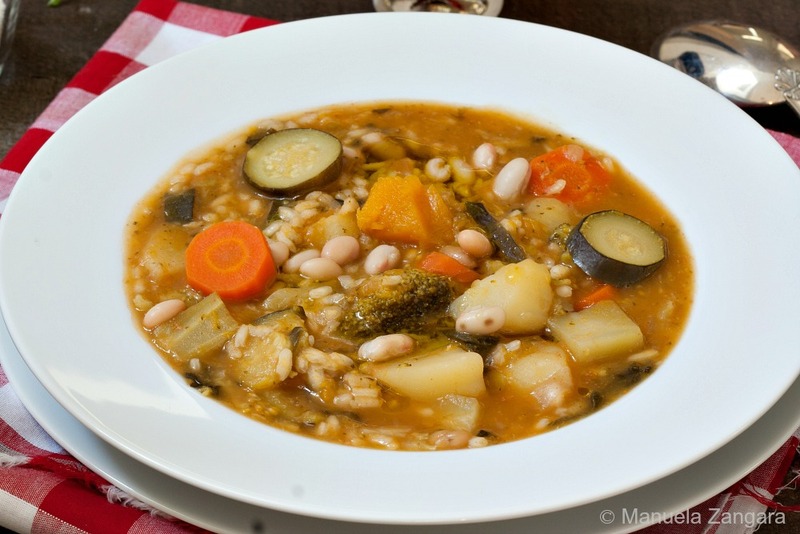 How to make a classic Italian soup: Minestrone, mixed vegetable soup with rice (or pasta). Put all the ingredients (apart from the rice and extra virgin olive oil) in a pot. Add enough water to cover the vegetables (you can add more at a later stage, if required). Cook, uncovered, on a medium flame for 30 minutes. Add the rice and cook for a further 15 to 20 minutes or until the rice is cooked, but still al dente. Serve warm with a drizzle of extra virgin olive oil and grated Pecorino Romano (optional). It looks so good!!! Cruised and signed up! Bellissima!